Keith Curle has confirmed he expects more comings and goings at the PTS Academy Stadium over the final few days of the January transfer window. The exit door has been far more utilised than the entrance over the first three weeks, with five players leaving the club and just two joining. But Curle says he does expect there to be more movement over the next nine days, and probably in both directions. 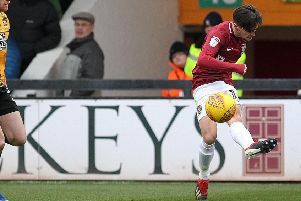 The signing of West Ham United midfielder Joe Powell on loan on Monday was the second incoming for the Cobblers, following on from another loan deal for Brighton & Hove Albion wing-back George Cox a fortnight earlier. Kevin van Veen, Matt Crooks, Billy Waters, Lewis Ward have all gone the other way as Curle maintains what he calls the ‘housekeeping’ of the Town squad he inherited from Dean Austin at the beginning of October. And he admitted that the business to date, as well as what is to come, all helps ‘address some of the deficits that are in place’ at the PTS. “I think there will be more coming in, and I think there might still be a few going in the opposite direction,” said Curle. “That is if it is right for me, if it is right for the football club and if it is right for the player. “This is a difficult window, and as I have said before I am not prepared to gamble in it with the finances that are available. “If it means we show good housekeeping and address some of the deficits that are in place at the football club, then so be it. The Cobblers were struggling for senior players for last weekend’s 3-2 defeat at Cambridge United. Sam Foley, Ash Taylor, John-Joe O’Toole and were Dean Bowditch all ruled out before the game, while Shaun McWilliams and Cox suffered injuries during it, but it is still too early to say who will recover in time for the weekend clash with Morecambe.